Once you have discovered that sleep apnea is stopping you from getting a restful and recuperative night’s rest, it is time to pursue a course of treatment. Unfortunately, there is not a medication that you can take to cure this chronic illness. There are, however, many different types of treatments. Doctors and sleep specialists will recommend the least invasive and safest methods possible first, only moving toward surgical options and other invasive procedures if absolutely necessary. Excess weight – Individuals that are overweight are at a higher risk for experiencing breathing cessation while sleeping. Being overweight can cause respiratory issues and blockages in the airways that lead to obstructive sleep apnea. Through safe diet and exercise, these causes can be removed. Drinking – Drinking alcohol, especially before going to sleep, can cause breathing issues. The alcohol causes the muscles needed for breathing to relax and not function properly during sleep. Smoking – Smoking can cause the tissues in the respiratory system to become inflamed and irritated. As the tissues become enlarged, this can lead to obstructions in the airway that make breathing difficult. If lifestyle changes alone cannot help with your sleep apnea, you might need a mechanical breathing therapy device. One of the most common is a CPAP or continuous positive airway pressure machine. During this treatment, the machine helps increase the airflow to the body and prevents the collapse of the soft palate. Other breathing therapy machines include BPAP machines, which varies the amount of pressure while inhaling and exhaling, and ASV machines, which change pressure on an as-needed basis, as it closely monitors breathing patterns. The most common complaint with these devices is the need to wear a mask while sleeping. The mask must be fitted carefully and properly to provide the most comfort possible. 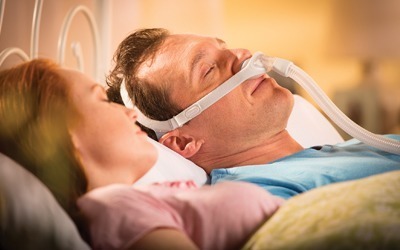 In cases of central sleep apnea, when lack of oxygen is caused because the brain is not sending proper signals for breathing control, oxygen delivered via a nasal insert may be necessary. If all other treatments are not effective, and the sleep apnea is caused by an obstruction, surgery may be recommended. Surgery may be used to remove infected or inflamed tissues or restructure the air passageways to allow for greater airflow. In very severe cases, a tracheostomy may be performed to insert a tube into the lower portion of the neck. Each plan of treatment is tailored to the individual. Contact your physician or make an appointment with a sleep clinic to learn more about treatment options that are best for you.